Over at Stereohunter, Comet Al challenged us to find a number of asteroids, including the asteroids 3 Juno, 23 Thalia and 11 Parthenope in the STEREO H2A images from 16-17 July. So I'm up for a challenge. I downloaded the images, gussied them up and started searching. At least part of the failure has to do with parallax, but before I get to that, I need to point out a couple of issues with the STEREO images. First off, they are FTS images, so you need a image package that can handle FTS (like ImageJ or The GIMP). Then, in order to see the apparent motion of the asteroids against the star field, you need to stack them and animate them in some way. Assuming you can handle that, then comes your greatest challenge. Working out what the heck you are looking at. This is fairly easy when some bright and obvious constellation id the the field of view of the STEREO cameras, but not so easy when there is a fairly nondescript field. Click on the image above to enlarge it and try and work out what constellations are in view. Once you have done that, scroll down and have a look at the annotated images below, with the equivalent SkyMap chart beside it (you should click on them to enlarge them for effective comparison). First off, the imaging system of the STEREO cameras isn't quite uniform across the field, so some stars seem to have different brightness to what you expect when compared to the chart. The chart is in RA/Dec mode as well, otherwise the chart orientation won't match the STEREO image orientation. You also need to play with the black/white balance a bit to enhance the brightness of the stars and make identification easier. What threw me for a little while was that I couldn't find Spica. The STEREO camera has a wedge shaped section in its field of view where no images are formed (instrument shadow? ), and Spica fell into this blank bit. Now, once the locations of stars was sorted out, it was on to hunt asteroids. It was here the parallax problem came into play. People comparing the image to the chart will be immediately see that Venus is not where the chart says it should be, although Saturn is (more or less). Note Venus has enormous artefactual spikes due to the way the STEREO imaging camera is setup. Anyway, Venus is displaced around 23 degrees from where the chart says it should be. This is because of the orbits of the STEREO spacecraft. STEREO A orbits ahead of the Earth, by around 23 degrees of solar longitude. Looking at the Sun from STEREO A, Venus is relatively close and shifted around 23 degrees against the background stars from our perspective, but Saturn is fairly far away on the other side of the Sun, and shifts very little (use the distance slider on the JAVA applet showing the STEREO orbits to get a feel for Saturn's and Venus's relative locations0. The asteroids are somewhat in between, and will shift by a different amount. 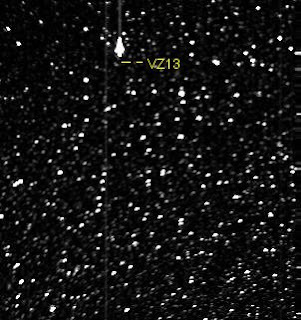 For example, comet VZ13 is shifted by around 10 degrees from its earth-centric chart position. Now, if I was a math kinda guy, I could write an algorithm to compute the offset of any given asteroid and apply that to the images. But there is a reason I'm a biologist. I've been hunting for STEREO orbital elements, so that I can put them into Celestia, and view the sky from the satellite POV, but to no avail so far. So I did the next best thing, and did a manual approximation. 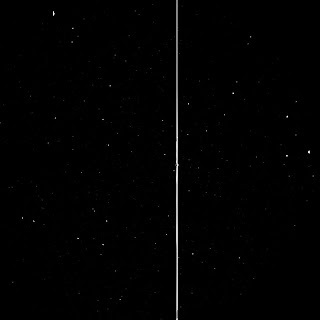 In the marked-up STEREO image above (the one with the constellation lines, you will need to click on it and enlarge it to see this). The red crosses indicate where the chart says the asteroids should be, the yellow crosses where they would be at 2 3 degree displacement (Juno and Thalia are off the map at this displacement), and the sort-of-pink crosses where they would be at 10 degree displacement. If anyone thinks hunting for comets in STEREO images is a doddle, just try the exercise of looking for named asteroids. To find a new comet you have to find a moving object in the images (not easy when it is faint amongst crowded stars), then sort it out from known asteroids at variable parallax offsets and a variety of artifacts. Now, if you want to be a STEREO comet hunter, you have to do this relentlessly, night after night, on stacks of dozens of images, in the hope of finding that faint something that is an unknown comet. STEREO comet hunting is far from a doddle. Still it's a great challenge. The 13th Carnival of Space, the Galactic edition, is now up at LiftPort. This is a jam packed edition, with everything from PowerPoint, to Harry Potter to history to Spacecraft. Pull your self up by your bootstraps and have a read. If you want to nominate a post for the next Carnival the instructions are here. 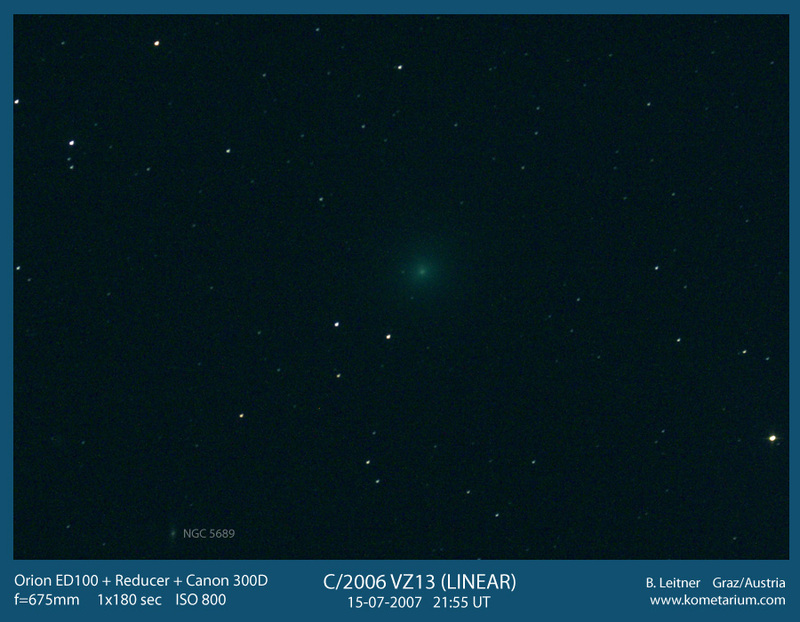 Comet 2006 VZ13 (the faint dot bracketed by Yellow Bars, the over exposed blob is Arcturus) has been delighting the folks in the northern Hemisphere recently. 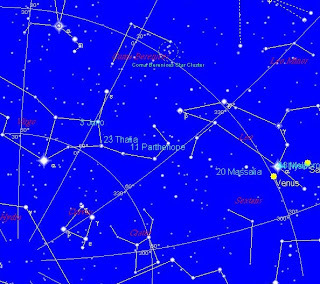 It's a relatively "bright" comet (ie at its brightest, you could just see it in 10x50 binoculars) that has zipped through Draco, into Bootes and headed for Virgo (see ephemeris here). Unfortunately for Earth bound observers, it's pretty close to the Sun now, but that puts it in the view of the STEREO and SOHO instruments. Karl Batthams first picked it up in the images from the STEREO H2A instrument and through his directions I was able to find it myself (Look in images from 22-07-2007. With (0,0) being the pixels in the upper-left corner, the comet is at 266,58 at 00:09UT, very close to the brightest star in that region (Arcturus). I made an animation of the comet, you can download the animation here (348 Kb AVI). VZ13 should still be in the STEREO field of View until tomorrow, so I'll try and do some more shots. Burkhard Leitner, some more nice shots from Jean-Gabriel Bosch and finally a great animation of VZ13 close to NGC 5633 from Gianluca Masi. Props to Comet Al for showing me how to align images in ImageJ, saving me heaps of time. 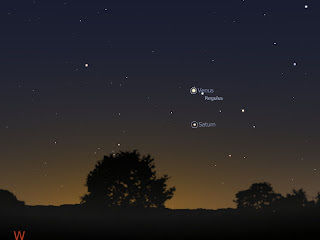 Venus, Regulus and Saturn in the early evening (click to enlarge the image to see Satrun and Regulus properly). Well, as I said below, The combination of the triangle formed by Venus, Saturn and Regulus (left), and that of the Moon, Antares and Jupiter (see below) was rather attractive. Clouds covered the sky at first, but the clelared enough to let me see the patterns. Now if I can only get up at 3:00 am for the occulation. The Moon near Antares and Jupiter, click on the image to see more detail in the Scorpion. 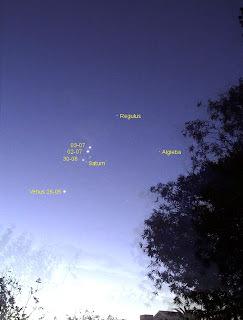 The western horizon as seen at 6:00pm local time Wednesday July 25 from the southern hemisphere. 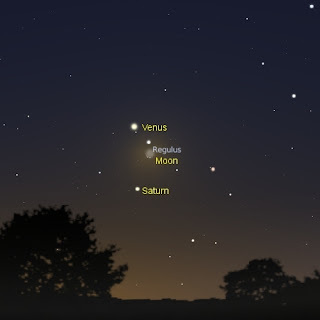 Tonight, if you look to the west from around 5:30 you will see a broad triangle formed by Venus, the star Regulus and Saturn. Not particularly special but rather pretty. If you look to the east you can see the Moon near the red star Antares, just above Jupiter. Again rather nice. 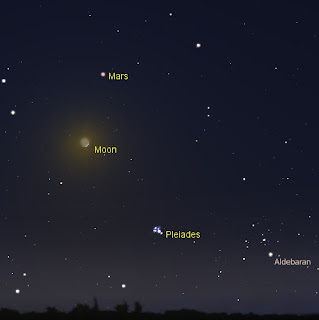 If you are an early riser, on the morning of Thursday July 26 you can watch the Moon cover Antares around 3:oo am. This occultation is visible only in South Eastern Australia. Details and contact times are available here. The Zombie Mars Hoax That Will Not Die! It's BAAACCKK!!! Yes, the Mars Hoax is circulating again. First surfacing in 2003, during the great opposition of Mars, it seems to pop up regularly around August, the time of the 2003 opposition. Mars is at opposition this year, but on December 25th, with a rather ordinary apparent diameter of 16 arc seconds (the August 2003 opposition Mars was 25 arc seconds across, hardly the diameter of the full moon, even through a modest telescope). This will be a visible disk in even small telescopes, but you will need a modest diameter scope to see reasonable detail. We don't get to see Mars at a decent diameter again until May 2016. In the meantime, check out J Beish's guide to the 2007 opposition of Mars, or drop in to the International Mars Watch site, for the slightly oldish news and some great image archives. The images show the dust storm that is threatening the Mars Rovers. Check out Tom's story on this, as well as his story on the Mars dust devil. The Tripoli Six have been Freed!!!!! Fantastic news!!! The 6 medics and nurses that were flasely convicted of knowingly injected kids with HIV and sentenced to death (commuted to life) have been freed!. In this bizzare case, the 6 were first accused of injecting the kids at the behest of the CIA, and then doing it as part of undercover drug trials. Scientific evidence that they were innocent was rejected. But a compensation deal saw them repatriated to Bulgaria, and their 8 year ordeal is at last over. In Animations of Venus I showed what could be done with an unguided 114 mm Newtonian and a cheap web cam. Inspired by DaveP, I tried out some mobile phone astrophotography. If you want a low cost digital camera, few come cheaper than the cameras in mobile phones these days. Some even come with 5 megapixel cameras (of course they are a bit more expensive). EldestOne has some friends over in the evening, and wonder of wonders the sky wasn't cloudy, so I set up the 8" for them to look at the Moon. Afterwards, when we had watched Nerds FC and Dr. Who, I tried capturing the Moon on my mobile phone camera. The result can be seen above (click to the image to enlarge it). The image was taken by holding the phone up to my 12.5 mm eyepiece, and simply clicking. Not as good as this mobile phone image of the Moon, but not bad (it's not even in night mode). Compare it with DaveP's Moon shot. If I had done something clever like using rubber bands to attach the phone to the scope, or properly centred the image so there was no edge distortion, it might have been better. This image was much harder. This is Jupiter. Jupiter is greatly overexposed, even with the standard mobile setting, but you can see 3 of Jupiter's Moons, two to the left and the horribly distorted blob to the right is Europa. Not as good as DaveP's image of Saturn, but not bad. This was taken using my 6 mm eyepiece and was much harder. It took me ages to get Jupiter into the field of view of the camera. I had to ensure Jupiter was dead centre in the eyepiece, and even then it was hit or miss to come across it in the camera filed of view. I wasn't quite so careful in ensuring the camera was steady, as I was worried about losing the image (which had happened a few times already, with much frustrating hunting around). I actually took a darkframe, and subtracted it in the Gimp. In both the Moon and Jupiter images, I had the focus set up so the image was focused for my eyes in the eyepiece, then just wacked the camera on and clicked the button (made rather easy by the camera/button layout on my mobile). So there you have it, mobile phone astrophotography, see this site for some more images and hints. Get out there and get snapping (should work with binoculars too). The 12th Carnival of Space, the Galactic edition, is now up at Music of the Spheres. There is lots about Galaxies in this edition, especially the online project Galactic Zoo. Also featured is space exploration and nanotechnology. Spiral over and have a read. If you want to nominate a post for the next Carnival the instructions are here. Strip image of the Phases of Venus (click image above to enlarge). Sometime in September 1610, Galileo trained his telescope on Venus and began observing its phases. This seminal series of observations was the death blow for the Ptolemaic conception of the solar system, an Earth-centred solar system could not display the phases of Venus that Galileo had seen. The phases of Venus are one of the simplest observations that an amateur can make to convince themselves that the planets do not rotate around the Earth. Because Venus is so large in its crescent phases, even small, home-made instruments can pick up the changes in size and illumination so you don't have to take astronomers words on faith. When Venus's crescent is at its thinnest, even binoculars with decent optics can pick it up. The Great Venus Phases Animation (450Kb GIF file). This animation was made from images taken between 11 February 2006 and 26 June 2006. Initially, images were taken every three days, but as time wore on, and the weather got lousy, by the end I was taking an image every 2-3 weeks. The images were taken through a 114 mm York Optical Skyrover Newtonian Refractor Reflector with an elderly black and white QuickCam using a Mogg adaptor. 2 minute AVI's (1 frame /second) were taken using Vega, then stacked using Registax. Processing was limited to dropping poor frames and adjusting wavelets to 9.0. Images from each observing session were overlain in The Gimp using layers, and difference mode to accurately align the layers. As some images were a bit skewed, the layer rotate tool was used to get images in the same orientation. And there you have it. It's not the best animation of Venus's Phases (see here for a stunning one), but its shows what you can do with a very simple, entry level reflector and a cheap web cam. Astrophotography is not just for big scopes with expensive CCD cams. Hi there, just have a momnet to log in from the IBRO conference. Lots of good stuff here. I'll try and report back if I have a chance. I'll be off that the International Brain Research Organisation Conference in Melbourne for about a week. 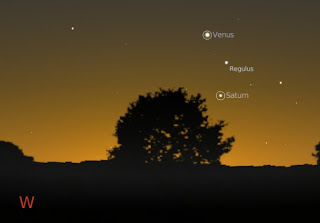 While I'm away, talk amongst yourselves, look out for Venus and Regulus, Venus and the Moon and daytime Venus. Take some pictures and send them to me, because I will be listening to the latest advances in brain research, not looking at the sky. The 10th Carnival of Space will be at Brian Dunbar's Space for Commerce in about 24 hours. It will have heaps of Space Carnival Goodness, so go have a look. This image from reader Michael Whittaker shows a double Moon (click to enlarge image). It's an optical illusions, but the effect is quite fetching. The July Jodcast is here. The crew at Jodrell Bank have some Harry Potter themed material, and a recoding of the Moon Bounce poetry event, as well as cool interviews and a whole lot of astronomical goodies. Go listen now! Peripatetic Philosopher John Wilkins over at Evolving thoughts has Tagged me with the 8 things meme. So here are my 8 facts. 1. 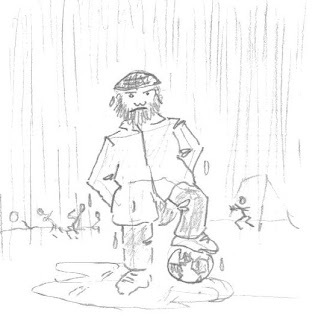 For my sins, I half-coach the under 13's soccer team for Eldest Ones School. Eldest One plays midfield mostly. So far, with the current team (a merged U11 and U13 team) we have not actually won a game. But we will. 2. You know the scene in Nerds FC season one, where they pay against a prison team. Well the same thing happened to my old soccer team, The Vultures. We had to play Boggo Road Prison team. It was a very scary experience. 3. I used to be a cartoonist in my early years. With some friends, we bought an old offset printing machine and tried to produce our own comics. If there is any justice in the Universe, no copies of these will exist. 4. I like folk music (but I don't dance around with hankies and bells), and (very) occasionally the Bettdeckererschnappender weisle and I hang out at the South Australian Folk centre (when the kids let us). 5. I really like the music of Mal Webb, and have done a couple of vocal workshops with him (along with lots of other people). Sadly, it would have helped if I actually had some musical talent (unlike the Bettdeckererschnappender weisle, who has a beautiful singing voice). I even got to be his chauffeur once. My favorite song of his is Waterbears , about microscopicanimalcules that resist boiling, freezing and hard vacuum. Here is a video of Mal Webbs vocal chords in action. 6. I like bushwalking, and combining bushwalking and folk music in Folk Camps is really cool. 7. I have 4 telescopes, my bushwalking 50 mm refractor, my 115 mm reflector, the old 6" reflector I built with my dad and the 8" reflector I inherited from a family friend. 8. I love 3D molecular visualisation. The North Western horizon at around 6:10 pm local time, Tuesday July 17th in the southern hemisphere. On this night Venus, Saturn, Regulus and the crescent Moon are within a circle of 4 fingerwidths radius. This will be a very attractive sight, and a good opportunity for astrophotography. As well, earlier on July 17th there is an opportunity to locate Venus in the daytime when it is just three fingerwidths from the 3 day old crescent Moon. To locate Venus in the daytime, you will need to look in the afternoon, when the Moon is well above the horizon. The best time to look is around 3 pm local time. 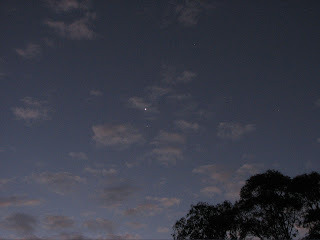 Then the Moon and Venus are almost directly to the north, and about 7 handspans above the horizon. The best time for photography is later, when the Sun is low to the horizon, and the sky is darker, making it easier to pick up Venus. If you have binoculars, you might be able to pick up Saturn as well, just under 3 fingerwidths away. But, as with all daylight observing, be extremely careful not to look in the direction of the Sun. Make sure the Sun is hidden behind something substantial, like a wall or building, not a tree. Never look directly at the Sun with unprotected eyes; you can permanently destroy your eyesight. The Moon is about 5 handspans east of the Sun. With the Sun hidden behind something, this should keep you from accidental exposure. The Moon may not be easily apparent at first, but allow time for your eyes to adjust and you should be able to pick out the 8% illuminated crescent. Venus will be three fingerwidths directly above the Moon, and should "pop out" almost instantly when you locate the Moon (it does for me, it was very easy to locate Venus last time). How about a competition? 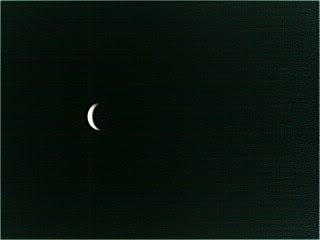 The best (or earliest in the day) image of Venus and the Moon taken during daytime and submitted to me will win a copy of the July-August Sky&Space. 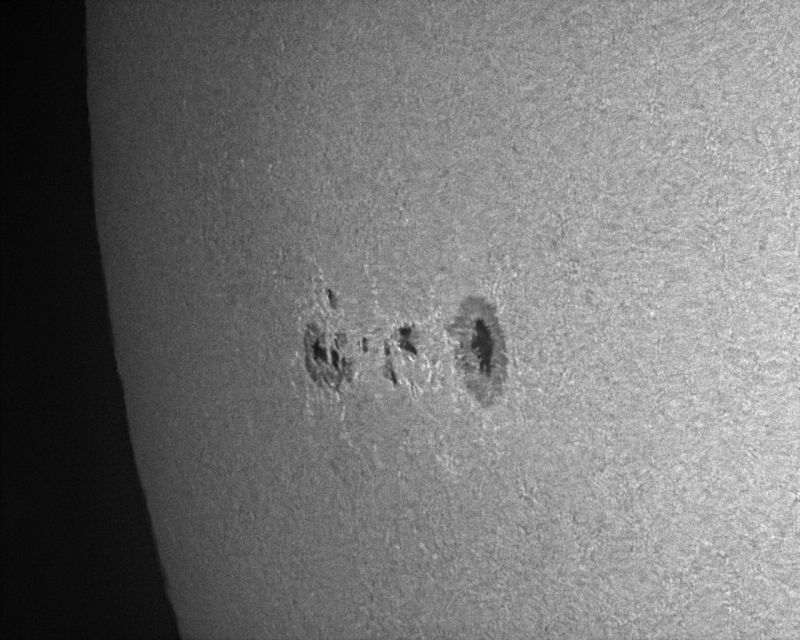 Sunspot 963 has just rotated onto the face of the Sun. It has a beta type magnetic field, and has produced a lot of C class flares. It has to potential to produce geoeffective solar flares capable of generating aurora. Of course, on the track record of past sunspots, its just as likely to go quiet. Space Weather has lots of great images and links, like the shots of the ISS going past sunspot 963, and of the sunspot itself as well as a great movie of the spot flaring. 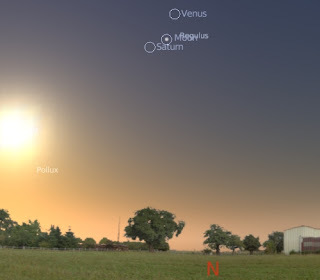 Evening sky as seen from the southern hemisphere at around 6:00 pm local time on Thursday 12 July, click image to enlarge it. If you have been watching Venus these past few days, you will have seen it make a triangle shape with Saturn and the star Regulus. Now Venus is edging closer to Regulus, and will be at its closest to the brightest star in Leo on Thursday. After this encounter, Venus and company have a few interesting encounters left, so the evening sky is a pretty interesting place for a while (and Yes, the Mars-Moon encounter was clouded out). The morning sky facing east at 5:00 am ACST on Tuesday, July 10. 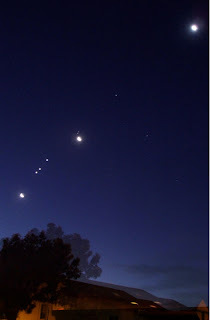 Mars, the crescent Moon and the Pleiades make a nice triangle in the early morning skies. them relatively close together, and you have a 3D image. I say basically, as the ahead images are bigger that the behind images, you have to rescale them. I download 512x512 images and rescale the ahead image to 455 x 455. Also, if you are downloading images other than those on the beacon images page, make sure you download images with the same date stamp as the beacon images, otherwise the features on the Sun won't link up properly. 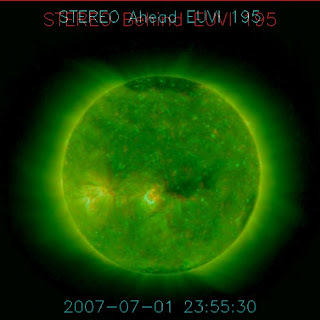 The lower image on the left is a stereo anaglyph of the Sun. For these images you need coloured spectacles, with one red and one blue panel (like they give out at 3D movies). While the "crossing eyes" 3D image doesn't require any hardware, many people just can't cross their eyes to form stereo images, and anaglyphs work for everybody. Anyway, this image was created using the Gimp. I was alerted to this use of the Gimp by Peter Tagatac of Top of the Lawn, but never had an astronomical use for it until now. The full details of how to make an anaglyph with the Gimp is in this tutorial, so I won't repeat them here, but just point out some STEREO specific issues. As for the "crossed eyes" version, you will need to rescale the ahead image (and make sure you have the matching ahead and behind images). As well, it's important that the ahead image is the cyan filtered image, and the behind is the red filtered image (otherwise the 3D effect is mucked up). You will also need to overlay the images. After you have followed the tutorial instructions to create the red and cyan layers, turn the colour layers off, select the top image layer and set the layer attribute to difference, then move the top layer until the images are aligned. Then return the layer attribute to normal, restore the colour layers and proceed as with the tutorial. This image of the Venus Saturn Conjunction comes from Chris Wyatt (you need to click on the image to enlarge it, its a big inage though). Chris is from Bendigo, Victoria and uses a Canon PS S2IS. See here for his image of the occultation of Antares. The Adelaide Festival of Ideas Starts today and runs over the weekend. Speakers include James Lovelock, of Giaia fame, and Norman Swan of the Helath report. The schedule is here. For astronomy buffs, on Sunday at 1.45 am-12.30 pm Miriam Baltuck from the Canberra Tracking Facility will speak on Life Beyond Earth. The 10th Carnival of Space is here! The 10th Carnival of Space is here! Rockets feature in this issue, with disussions of innovative proulsions systems, new vehichles, hazards to pspace vechicles and discussions of the latest shuttle mission, Launch yourself over there now! Venus and Saturn shine above the Semaphore Jetty as waves pound into it (click to enlarge). A combination of high tide and gale force winds brought the water right up to the edge of the beach. Largs Jetty is pretty high, but still had the occasional wave coming over it. Semaphore Jetty is lower, and the far end was pretty well covered by incoming waves. This image may not be the steadiest, as my round the corner neighbour had to hold the tripod down so it wasn't blown away. Eldest one was flat out moving forward in the wind, and middle one was pretending to be a human kite. This image gives you a better idea of the waves slamming into the Jetty, The decking at the weather end had been pretty well torn up, but I couldn't get an image of that through the spray. We are lucky that the storm did not hit during the king tide a few days ago. As it was, Birkenhead bridge was closed off due to flooding of the approaches, parts of Port Adelaide and the old Railway yards were flooded. Following on from "The Sky is a Sphere", these shots of the conjunction of Venus and Saturn are taken around the same time (roughly between 6:00 pm and 6:10 pm ACST), between June 26 and July 3. Naturally you have to click on the image to enlarge it and get the best detail. Gaps are coaused by bad weather. As well as the sky rotating due to time differences between each shot, every night the stars set a little earlier too. I've lined every thing up on Regulus and Algieba but these stars move with respect to the tree in the back yard as well. So even if I did get the pictures all at the same time (and assuming that I got the camera in the right spot each time), the images of the trees would be out of registration. Still, I'm getting the hang of the Gimps rotation tool, so this lot was easier to assemble than the last. I might make an animation of it. The sky is a sphere. Which is why when I try and line up multiple shots taken at slightly different times, I can never get them straight. 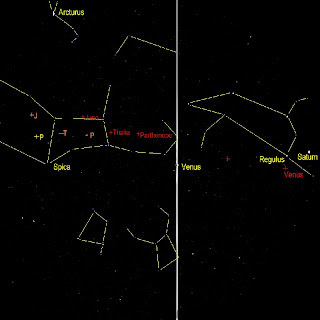 Because the sky has rotated, rather than simply moved below the horizon, just overlaying the images and lining up on one star, say Regulus, means that anything a little bit away from Regulus will not be lined up. So to make this mosaic of Venus, the Moon and Saturn over 4 days, I had to rotate the images manually in the Gimp and line up two stars to get things more or less in line (obviously I can't use Venus or Saturn, as they are moving every night). This was a right royal pain, but I more or less got there in the end, and I'm rather pleased with the effect. Click on the image to enlarge it and make Saturn more obvious, its the dot above the Middle Moon, Venus is the brightest object and Regulus is the dot between the Middle and Upper Moon. Of course, it would have been technically easier to take the image at exactly the same time every night, but rumbustious small children, drifting clouds and dinner preparations makes it hard to get within 10 minutes of the same time, so that option is out. The images were taken on the 18th, 19th and 21st of June (the 20th was clouded out) in the lead up to the Venus Saturn conjunction. I'll post that image later. Pop over to the Panda's Thumb for my post on Haldanes Dilemma. The July issue of Southern Skywatch is now up. Venus and Saturn are close together, and Venus and Saturn have some attractive encounters. Also, instructions of how to see Venus in the daytime, and a difficult occultation of Antares.